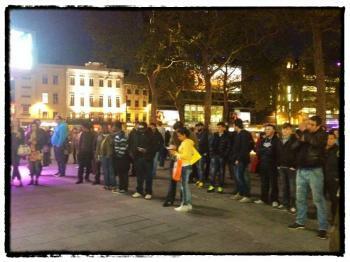 Evangelism in Leicester Square was fantastic last night. We had a good size team out, which really supported the preaching of the gospel in the open-air. A number of people stopped to listen, and some even engaged. The chap in photo (with his back to camera, on the left) asked a great question and after the preaching Regan was able to converse with him more thoroughly. This is what I love! — a public proclamation of the gospel that spills into one-to-one conversations. God is so good! 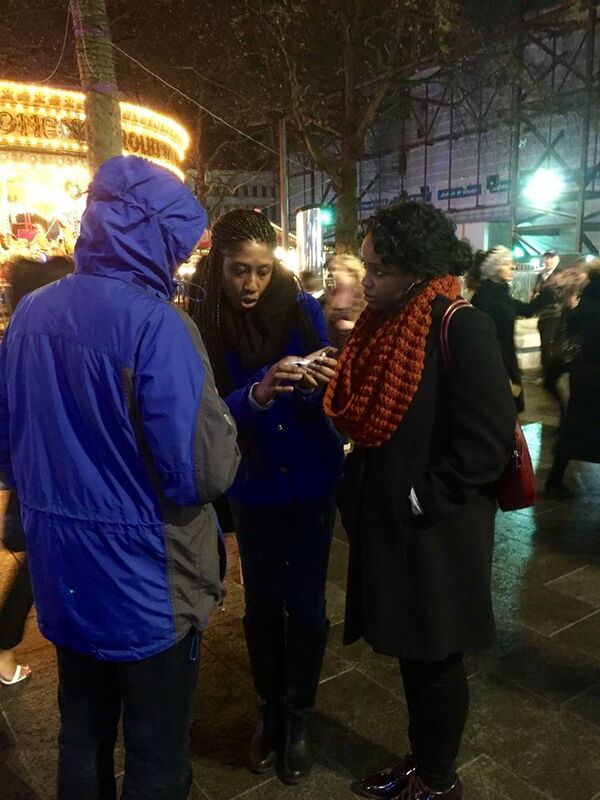 Evangelism this past Friday was a blessing. Katherine joined us for a second time and we also had a new visitor, Soko. The rest of the team included Kofi, Kwadwo, Steven, and myself. After enjoying a good time of Bible study and fellowship in Caffé Nero, we headed out. When we reached the square we found it to be quite noisy. A lot of buskers were out using amplification. There is a by-law in Leicester Square which says amplification is not allowed to be used after 9:00pm (we normally start around 8:00pm) and so as a team we have decided not to use it. Unfortunately, there are some buskers who ignore this by-law and continue using amplification after 9:00pm. There’s not a lot you can do about it when they choose to do this. Sometimes the council comes down on them, but often they do nothing. However, this doesn’t happen all the time, and so it’s not too big a deal. As it so happened I was suffering with a cold last week and so in the end we didn’t do any open-air preaching. 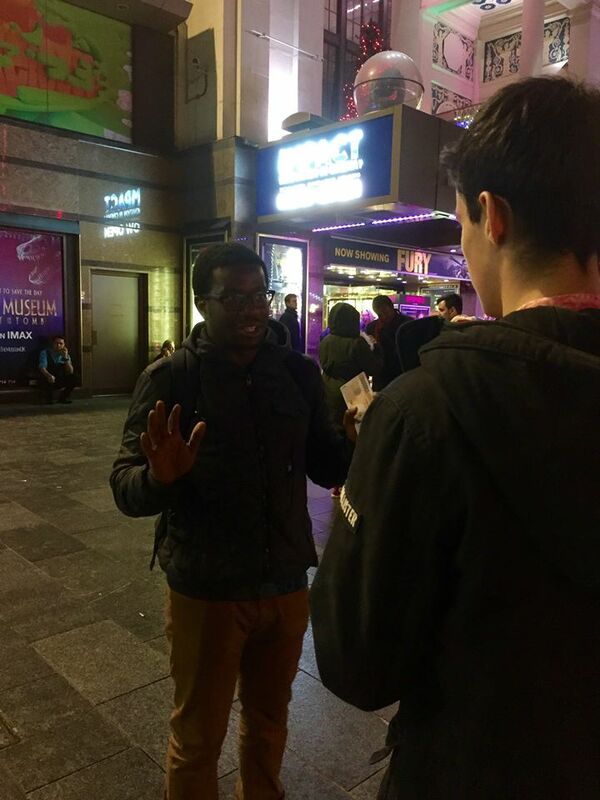 However, everyone on the team got stuck in handing out tracts and engaging people in conversation. I had an interesting conversation with a girl called Chloe. It was interesting because it was clear that she has spent some time formulating in her mind where she chooses to stand from a worldview perspective. She identified herself as a relativist and contested strongly the existence of absolutes. Curiously, she is willing to acknowledge the need for an ultimate standard (of whom I put forward the Christian God as the only rational, consistent truth), especially when we ask the question as to why anything is wrong. However, how can there be an ultimate standard if there are no absolutes? In other worlds, how can we be measured against an ultimate standard if the laws which flow from this standard are not absolute? This is something Chloe could not answer, and yet she remained resolute in her denial of moral absolutes. I informed her as graciously as I could that she was being philosophically inconsistent in her reasoning, and I’m grateful that she received this without taking offence. We parted company on good terms, which was pleasing. Of course, my aim is always to bring a person to the cross, but sometimes it is not always possible to discuss the gospel in depth. However, I was encouraged that I was able to argue for the one, true God, and that Chloe was made to see that without Him, life is ultimately meaningless. The rest of the team had some good conversations too. Katherine is doing very well and enjoying being out with us, and Soko really got stuck in on her first night. I have to say that I always find it such an encouragement to see brothers and sisters from different churches coming together for the cause of the gospel. It’s such a blessing! Our God is such an awesome God, there truly is none like Him. The team met this past Friday night in Caffé Nero after a somewhat short hiatus. I have only recently got back from a mission trip to South Africa with my church and so it was a real joy to be back out again. It was also a blessing to have two new people join us! Before I left for SA Katherine contacted me expressing her desire to come out and join the team. I informed her that we would be back out again as soon as I was back and so it was great to see her on Friday. Another girl, Yvette (pictured below, left), also joined us. She and her husband have recently started attending my home church and as soon as they heard of our ministry Yvette decided to join us. So it was great to have them both with us, and I think especially as it is always good when there is more than one girl attending :-) Kwadwo was also with us, and his brother Kofi joined us a little later. After a great time of fellowship and Bible study in Caffé Nero, we headed out to the square. Standing up to preach it wasn’t long before a medium size crowd had formed. I framed my message by first affirming the existence of God using the moral argument, and then transitioned the conversation to the law of God — answering the question, “Why is sin wrong in the eyes of God?” I have found this to be a helpful thing to do. People need to know what sin is, but they also need to know why sin is wrong. It is wrong to sin because God is not a liar, or a thief, or a murderer. God created us in His image so that we would image Him. This is why sin is wrong, for when we sin we misrepresent God. Lying is wrong because God does not lie. Stealing is wrong because God does not steal. Moreover, if it were true that God does not exist, we couldn’t even answer the question! Indeed, this is whole point of the matter! Without God, we have no basis for saying that anything is wrong. God exists for the simple reason of the impossibility of the contrary. A few people from the crowd engaged my argument and this was great not only for their benefit, but also for the rest of the crowd who were listening in. One chap in particular, a young man named Oliver, stayed until the end of the preaching, and continued talking afterwards with Kwadwo for at least an hour! He told Kwadwo that although he has grown up in a Christian home, he was only prepared to say, “Most likely there is a higher power but I’m not sure who that is.” Kwadwo showed him that in truth all people know in their heart of hearts that God exists, because if He did not exist we could not make sense of this world. The truth is, we all know that God exists, and this is why we are without excuse for denying Him (see Romans 1:18-21). Please pray for Oliver! Myself and Yvette also had a good conversation with two young ladies who listened well as we shared the gospel with them. It was very clear that there was conviction of sin in their hearts, and there was certainly a recognition from them that they stood before God without an excuse. It was great to share the good news of the death, burial and resurrection of Jesus Christ with them, as the foundation had been laid for them to appreciate and appropriate the good news, since they now had an understanding of the bad news. Do pray for them!! 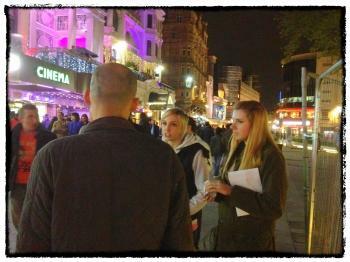 On Friday, 28th November, the team was out once more in Leicester Square to preach Christ crucified. We were seven strong: Glen, Waithera, Esther, Andrew, Kwadwo, Steven, and Rob. After meeting in Caffé Nero for a time of prayer and Bible study, we headed over to the Square. It was very loud due to a carnival atmosphere, but I was still able to preach for a short while during one of the quiet periods! Steven: I spoke to a guy called Daniel who denied the God of the Bible as something made up by "the system." When I pushed him to account for his knowledge of this it basically boiled down to him knowing it because some higher power revealed it, but he couldn't account for the truth of this "revelation" either. He knew because he knew. Also, I had a conversation with a guy called Kan, not sure if he was all there but he was very open to know more about the Gospel so we exchanged e-mails. I had an encouraging conversation with a young couple earlier in the evening who listened well as I explained the gospel to them. We spoke for some time and it did amaze me how prepared they were to stand and listen to what I had to say. God is so good. Towards the end I asked if they had ever heard anything like it before, and they said no. But then they said that it made a lot of sense, and that there was nothing they could come up with that could rebutt what they had heard. They left saying that they had a lot to think about. Do pray for them!! (the Lord knows their names). 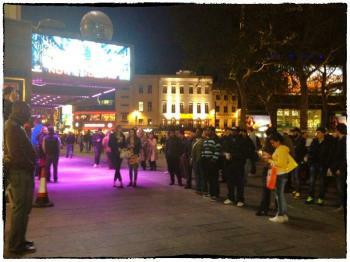 On Friday night the team was out in Leicester Square, excited and eager to tell people about Jesus. We were six strong, which is a good number :-) — Rob, Gemma, Kwadwo, Glen, Graham and Megan. Graham and Megan were with us for the first time. We met first of all in Caffé Nero for a time of Bible study and preparation. This is always a great thing to do and it really does help. Arriving in the square I stepped up to preach. It wasn't long before we had quite a crowd. There were a number of hecklers in the crowd, which was really good, as that really does bring in a crowd. One particular gentleman felt very strongly that we do not need God to make sense of this world, particaliry when it comes to the area of morality. I reasoned with him and pointed out that if we do not have an ultimate standard we are left short every time. He pointed out that morality evolves over time, and this is how we deal with different ethical situations. I showed him where his logic will lead by asking him if he would be prepared to say that it is possible that paedophilia, which is considered immoral today, could be considered moral in the future, since he believed that morality changes. Astonishingly, he said yes! But I do believe the crowd saw my point!! I spent a great deal of time dealing with objections from the crowd, and answering different questions. However, I was very keen to steer the conversation towards the cross. Sometimes this can be difficult when you are being bombarded continuously. Thankfully, I was able to do this. The following LINK picks up my message towards the end, when I was able to address a young couple in the crowd and point them to the gospel before they left. Gemma: On Friday night Kwadwo and I spoke with a young couple Callum and Christine. They were very eager to wait around after the preach to discuss what had been said. Callum explained how there were so many different ideas about God that it was difficult to know the truth. We explained how the very definition of truth means there can only be one and we explained how Christianity is different from religion as we know we cannot reach the standard, but that God makes us good enough through the ultimate standard Jesus Christ. We explained the wonder of grace and how anyone who calls on the name of the Lord can be saved. They were very eager to hear about creation and Noah's ark and the flood which Kwadwo talked to them about. Callum explained that he had lost his brother and I was able to share a little of my testimony with him. Kwadwo: Gemma and I were able to have a very good and cooperative conversation with (what we assumed was) a young couple made up of Callum and Christine. They had heard a lot of the open air preaching and waited after to talk to someone. Callum started by asking about how we know that the God we believe is true when there are thousands of other gods worshipped. When we got past that they seemed a lot more open, and asked questions that lead to explaining just how radical grace is and they acknowledged that good works would be like bribing God, which isn't right. It was only Steven and myself this past Friday evening, but we had a great night, with some wonderful opportunities! Steven shared the gospel with a group of young lads (pictured to the right), with a young Muslim in particular who listened intently. My first conversation was with a chap named Bernard. He's from India but grew up in a Roman Catholic family. He told me that his current position is that of an agnostic. So we spent some time talking about the Bible and how we can know that it is true. I love these discussions because I know that I can show people that the Bible must be true, indeed is true, because if it were not true all of life is reduced to absurdity. It gives me so much confidence in my witness knowing that there is not one objection that any person can bring that can cast doubt upon the truthfulness of God's Word. Bernard listened well as I showed how we can know that the Bible must be true. It is true because of the impossibility of the contrary. When the Bible is removed from the equation, all of life is reduced to absurdity. And the reason for this is because the Bible provides a basis — on a moral level, when we speak about logic, the uniformity of nature (which is the bedrock of science), and even truth itself. We spoke about a few of these, particularly morality. I told him that every single day, people make moral judgments by appealing to moral absolutes. Indeed, it would be impossible to make a moral judgment without appealing to moral absolutes — moral laws that are true for all people at all times. However, without God, how do we account for the existence of these moral absolutes? The answer is simple: we can't. Without God, we simply cannot make sense of this world. So why is it then that people deny God? The Bible tells us that man suppresses the truth he knows, in unrighteousness (Romans 1:18), because he loves his sin (John 3:19). That is the ultimate reason. Therefore, God commands us to repent and trust in Jesus — the Son of God who lived the life that we can't live, to be who we cannot be, holy and acceptable in God's sight, and who died on a cross paying the penalty for our sins, was buried, but rose again on the third day, proving once and for all that sin and death had been defeated! Thanks for checking out my website, mate that was a great message you shared with us. i have decided repent today and entrust your life to Jesus. What church do you go to i would like to attend sometime. Dude, that's fantastic!! Very cool mate. Praise God! Hey, it might be good to meet up some time just to chat and wotnot. Free anytime next week? My church is in Tooting, South West London. But that may be a bit far for you to travel, so we could see if there's a church closer to where you're at. Where you based mate? But hey, don't get me wrong, I'd love for you to come along to us one Sunday. I'm just thinking of traveling and stuff. Please do be in prayer for him! I had a fruitful time of witnessing this morning outside Tooting Broadway station. Unfortunately, I was out by myself. However, the Lord was with me and that's what matters. By God's grace I was able to hand out a good number of tracts. I also had some great conversations. 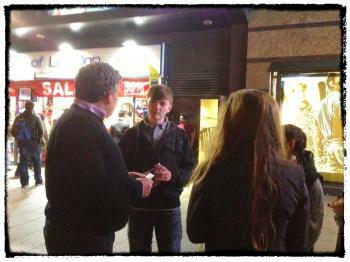 The most encouraging conversation I had was with a young couple who listened intently as I shared the gospel with them. It was great to hear them say that it made total sense for them. Please pray the Lord would draw them to repentance by His lovingkindness. If I were to ask you for a knowledge claim you must appeal to something: to one of your senses, or to your reasoning, etc. But then I could say to you, "How do you know that is valid?" and you no doubt would say, "Because of this or because of that.” But then I could say, "And how do you know that is valid...?" and so on and so on. What this means is that you hit an infinite regress, because there is no stopping point unless you know everything. So unless you know everything, or have revelation from someone who does know everything, you can't know anything. It all starts with God. The fear of the Lord is the beginning of knowledge. A little later we arrived in the Square and I got ready to preach. There was a man sat on the bench behind me, and I recognised him as someone who had heckled me in the past. On that particular occasion he had been very vulgar and rude. Still, we had prayed that the Lord would use us as He so willed, so I got up to preach as planned. As soon as I did the chap behind me came forward and began to heckle me, and he came at me hard. His speech was venomous and full of hate, not to mention vulgar and rude, and so I asked him to refrain from using such foul language because of the ladies who were present. His reply was to call me a misogynist pig. A misogynist is defined as a man who hates women. It's a word that has been levelled at Christians more and more frequently in recent times. It's basis is built on the notion that women are treated as unequal and inferior to men, in the Bible, because there are certain roles that men are called on to perform, and these roles are not permitted by God for women. A typical example would be that of women pastors. A rebuttal is quite simple here. God has designated different roles for men and women, for a specific reason. These commands come from God and therefore must be followed. But God is not arbitrary and so these are not random commands. Men and women are wired differently, for the very purpose of performing their unique roles to the glory of God. However, I would like to address the charge that I am a misogynist, simply because I said: "Sir, please refrain from using that language, there are women present." I believe he took issue with this because somehow it implies that women do not curse and swear, and so they shouldn't be given preferential treatment. That of course is not what I was saying. I was simply appealing to the gentleman's civility. I was also trying to expose his lack of respect for the audience, particularly the women, who generally speaking are not as vulgar as men when it comes to speech (although I do recognise the tide is shifting, and has been shifting for some time now). Still, it must be noted that what I said on Friday night was in no way misogynistic. If anything, I was esteeming women above men. So his assessment of me was wrong, and for many reasons. I must admit though, it was quite difficult to counter his aggressive rhetoric, but having had the time to think it through, I will certainly be better prepared for next time. I did not continue to preach open-air for too long, simply because our heckler had made that to be quite untenable. There were some young people in the crowd who had argued in my favour, to allow me to speak, etc, and so we got talking. I thanked them for their support and asked them where they stood spiritually. They said that they believed in God. However, as the conversation progressed, it became apparent that they believed the way to God could be found through any religion, it was not exclusive to Jesus Christ. Ultimately, this meant that they were unbelievers. They said that they believed in God, but clearly they did not believe in the God of the Bible, but rather in their own interpretation of God. I reasoned with them from the Scriptures and did my best to bring the truth to them, but they stood firm on what they believed. They left with a number of gospel tracts, and we can only pray that the Lord would open their eyes to the truth. What is it that holds us back from doing those things we know we shouldn’t? Well, it will either be our love for what is good, pure and honourable (with God being the very standard of what is good, as well as the one who instills within us the desire and ability to be good) or, it will be the threat of consequence. If it's the latter (the threat of consequence), ask yourself this question: what does that tell us of the human heart? How shallow must the human heart be when the only thing stopping us from doing wrong is this knowledge we have that we will suffer for it? If you show mercy towards a person, towards someone who deserves justice, then you haven’t acted in a just way, and if you show justice towards a person who deserves justice, then you have not expressed mercy towards the person. The point of course is that you cannot be both just and merciful at the same time, because you are either merciful at the expense of justice, or you are just at the expense of mercy. Looking now to Jesus, we learn from the Bible why He purposed to die for the world on a Roman cross. Jesus gave Himself up to be punished on our behalf. He bore the punishment for the sins we have committed so that we can go free. He never died on a cross because He had sinned, He died on a cross because He became the sin bearer. In so doing He is acting justly towards sin. Justice is being satisfied. At the same time He is acting mercifully towards those who have committed the sin. The unthinkable has happened: Justice and mercy are satisfied at the same time. It is to be understood in this way: God pours out His wrath against sin ~ justice is fulfilled. And by fulfilling His justice in this way, mercy is extended towards the one deserving the punishment. Forgiveness is not offered at the expense of God’s justice towards sin. Forgiveness is offered because God so graciously chooses to substitute Himself in our place. The above reveals a God who satisfies fully His justice and His mercy in a logically consistent way. Yes, He does the unthinkable in substituting Himself in our place, but what He does is not illogical. God shows Himself to be consistent with His nature. He is just and merciful. And even though this “seemingly” is an irreconcilable problem, God solves it in a logical and rational way. Moreover, because God shows Himself to be the perfect precondition for logic, this accounts also for Him being the perfect precondition for moral absolutes and the uniformity of nature, since God is indeed rational and logically consistent. Scripture reveals a God who is perfectly consistent in and of Himself. This explains why every other theistic religion in the world is beset with the problem of a “god” who does not satisfy fully his justice and his mercy. Only in Christianity is there a mediator. Only in a Mediator is there complete satisfaction for God with regard to His justice and His mercy. And only the Christian God offers to this world a Mediator, who stands in our place, taking upon Himself the judgment of God, so that we can receive mercy. Justice and mercy: two amazing attributes of God that reflect who He is, which come together beautifully on the cross of Jesus Christ. As I shared this with my Muslim friend I could tell he understood the argument. Still, there was resistance on his part. This is to be expected, as the subject of justice and mercy attacks one of the very pillars of his belief system. If he acknowledges the necessity of a mediator, so that God can be both just and merciful towards us, he ultimately gives up his belief system. We parted on good company and he took an in-depth gospel tract to read. Do pray for him. As we all started to wind down for the evening, I noticed that our angry and foul-mouthed heckler was engaged in a conversation with Roman. I wandered over and he began to boast how he had been able to have a much better conversation with Roman, one-to-one, in contrast to the conversation he’d had with me during the open-air. I explained that the answer to that was simple: “Sir, you used my platform (the ladder) to be your own platform, with the intent purpose to derail the message I sought to proclaim. Your agenda was to shut me down my being rude, vulgar, condescending and unreasonable.” To this he simply smirked disparagingly. Do pray that the Lord would soften his heart and open his eyes to the truth. Pray the Lord would save such a sinner as this, for we are all unworthy of His bountiful grace. It was a tough evening for sure, but a blessed one all the same. It was another great night of ministry this past Friday, much to be thankful for! The Lord is a good God, and to be used by Him for the glory of His name is an amazing privilege indeed. The team on Friday was Kofi, Kwabena, Kwadwo, Winston, Lauren, Steven, Annika, Gareth (plus his mate James, who is not a Christian) and myself. It was certainly interesting to have James join us. 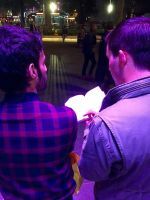 Gareth did tell him we would be ministering the gospel, yet he was still keen to attend. I think he was curious and it certainly showed. As a good friend to James, Gareth has been a great witness to him, which is awesome. Click here for a short video intro of the team. During the open-air preaching it was encouraging to see a good number of people stop to listen. About five minutes in three young guys began to heckle me. They seemed to be in their late teens/early twenties. They threw a barrage of questions at me, to which I answered as best I could. I have to say that I have lost count of the amount of times I’ve said to people, “There’s only one of me, and three of you. I can’t answer you all at the same time.” You have to take control when you preach open-air, of course it’s important to be godly in the way that you speak, but at the same time you must be firm. They moved on after a short while and I was able to address the crowd more fully. Praise God that the gospel went forth! After I finished preaching James approached me and commented on how well he thought I spoke. Receiving praise from others is certainly not the reason we preach, however in this instance it was very encouraging, particularly for the reason of who it was giving the praise. I was thrilled that James came. He heard the gospel during the open-air, he listened in on the conversations we had with people, and I also had the opportunity to speak with him more personally later on in the evening. Shortly after I had finished preaching, my three hecklers returned, demanding answers from me to their many questions. One question, in particular, focused in on slave-labour; does God enforce slave-labour. I immediately responded by saying that in no way does the Lord condone the abuse of men or women within the context of slavery. In response, they questioned why I had chosen to wear a Puma top, as apparently Puma clothing is produced through slave-labour in the East. I explained that even if that were so, I certainly do not condone slave-labour. It is terrible to think that there are many products that we use, or wear, in the world today, that are tainted by the inhumane abuse of men and women in their various productions. This is a reality of the world we live in, and in some way or another we all make use of products that come from a very questionable and regrettable source. It is important to understand that the Bible in no way condones slavery. It does not condone slavery, it simply recognises that it exists. It is the fallen nature of man that compels him to subjugate his fellow man to his will. Having said that, not all forms of slavery in Biblical times looked like the slavery of centuries later. Often it was simply the case of a master and his servant. The servant was still a slave, but the treatment was fair and just. Of course, this was not always the case in biblical times. Abuses were very common. However, slavery in more recent times almost always included heavy physical abuses, and it is to that connotation that we tend to think of when we speak of slavery today. So, with this understanding, we see in the Bible not a condemning, or condoning of slavery, but rather a regulating of it by calling for the highest form of Christ-honouring conduct (See Col. 3:22 & Col. 4:1). The New Testament therefore condemns all abuses of slavery on both sides. I continued to engage with them, answering different questions along the way. Over time I began to talk more exclusively with Lewis. He seemed far more interested and listened more closely to what I was saying. As I explained the gospel to him it was clear he understood what I was saying, in fact he also accepted many of the ramifications which arise from the gospel (the fact that we are all guilty and therefore deserve justice, etc). I was able to move the conversation in the direction of Christ, explaining why it was necessary for God to become a man. Click here for a brief, but concise, expansion on this subject. At one point Lewis’ friends tried to pull him away, but he resisted, insisting instead to hear out what I was saying. I was greatly encouraged. To the left you can see Gareth sharing the gospel. He is really growing in confidence and ability, and it is so encouraging to see. When a young Christian steps out like this to share his faith with others it helps to cement what he believes, it also helps to equip and grow him in his ability to answer objections and defend the gospel. So encouraging! I told Gareth that every conversation he has is preparation for the next conversation he will have. This of course is true for all of us. I would encourage you to step out and share your faith, the Lord is our strength, and even when we are not faithful, He is faithful, for He cannot deny Himself (2 Timothy 2:13). During the evening Kwadwo had a conversation with Marco, a postmodern relativist (with a Catholic background) from Italy, and Winston spoke with “T,” who showed conviction for his sin and was open to hear the gospel. You can see two short videos of their conversations here and here respectively. To the right you can see Lauren and Annika sharing the gospel. I was very pleased to see them working together, I think it’s helpful and wise for young women to join up, as and when they can, when ministering on the street. Later on Annika had a great conversation with a young man, who is really wrestling with eternal and spiritual issues at the moment. She expresses well her thoughts on that conversation below. As you read, do pray for him. “...my heart really hurts for this guy please pray that he would be saved!!! He also said he has heard other people’s conversion stories and really wishes it would happen to him so he knows for sure God is real and he can believe. Said he has considered Islam, as on the outside Muslims really appear to be obeying God and devoted to him. Said he knows he has a conscience, and knows he deliberately chooses to sin, but at the same time he feels like it is impossible for him to escape sin because no matter what, he knows he still chooses to sin. He said he knows that God (who he is not sure exists?) already knows if he is going to heaven or hell, which scares him but he knows he has responsibility for his own choices. He said: ‘Please convince me so I can believe it with my whole heart,’ as he was struggling to grasp it enough so that his lifestyle could change. The funny part was, a club promoter kept coming up trying to pull him away... The promoter then said he was a Christian. John said to him: ‘I'm sorry man, but you say you're a Christian and yet you are pulling people into a club and helping them to sin?? Don't take this personally but you are messed up.’ He then started telling the promoter about sin! As Annika shared the gospel with him, she made it clear that only the Lord can truly convince us. The reason anyone becomes a Christian is because he or she responds to His call, the call to repent and trust in Him. Just as it was with Lydia, when the apostle Paul spoke with her, it is the Lord who must open our hearts, so that we are able to pay keen attention to the message we are hearing (Acts 16:14b). It was definitely a full night of ministry. Much to be thankful for and much to pray for! Click here for a short debrief of the evening.